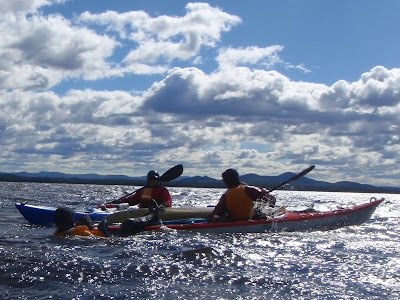 As last week progressed and the forecasts for strong offshore winds became more strident it also became obvious to all concerned that Broughton Island was not going to be a suitable destination for Sea Skills Assessments. 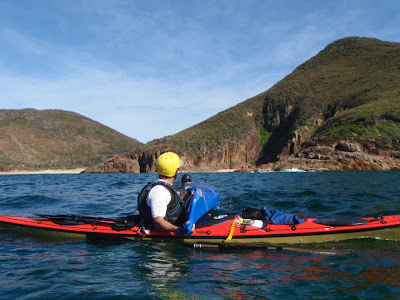 Karen Dallas from the Skee Kayak Centre had been tracking forecast trends and liasing with the Port Stephens VMR to produce a viable floatplan that kept us near shore and with accessible bail out points if the winds strengthened ahead of the forecast. 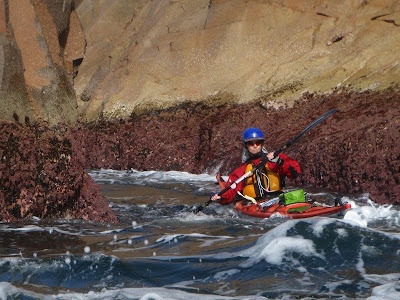 After logging on with the Coastal Patrol, Karen went through the safety briefing and finished with a reminder about surf signals and ettiquette. 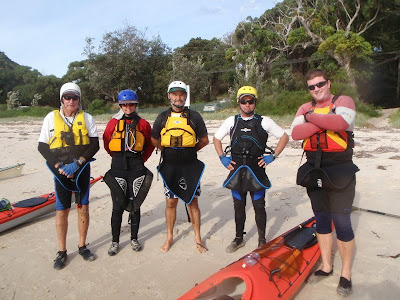 I first met Karen and her Coffs Harbour sea kayak group a couple of years ago and was immediately impressed with their positive attitude to surf, which is just as well, because up around "Coffs" you run out of options if you don't develop the skills to handle beach landings. 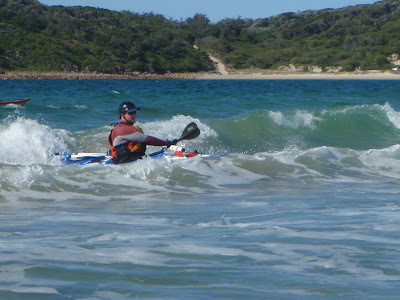 Above: Shane and Mick demonstrate good form catching small waves. This session lasted about an hour during which time the whole crew put on a good display while we worked towards the bigger end of the beach. There was a number of rolls but no swimmers. Well done guys! 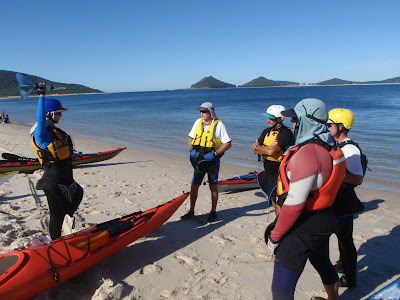 Regular practice even in small surf really sharpens up bracing and edge control and it was refreshing to see a group with none of the "surf phobia" I often see with Sydney paddlers. 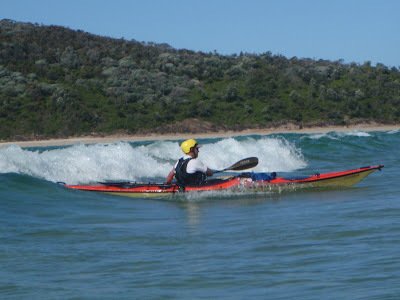 Those quiet North Coast beaches seem to provide a great training ground and with Karen as a leader and mentor these kayakers are learning fast. 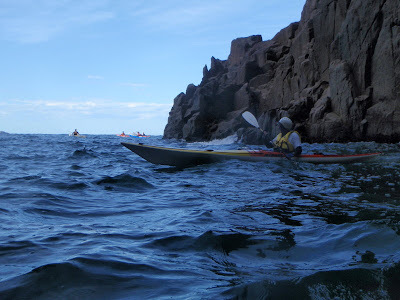 We reluctantly left the surf looking for new assessment challenges. 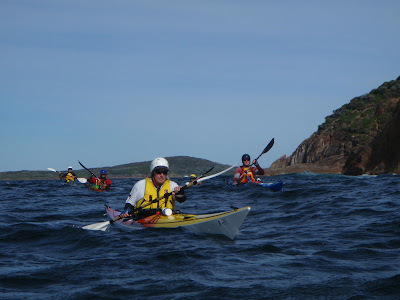 Here Terry leads the way as we follow the Tomaree headland out of the breeze. 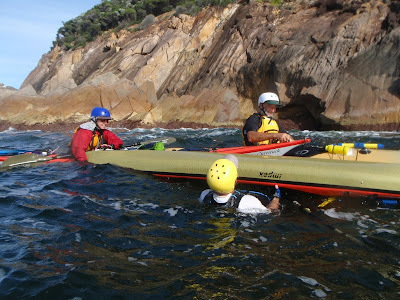 Deck carries, swimmer rescues and all sorts of variations were demonstrated in all sorts of conditions throughtout the weekend. 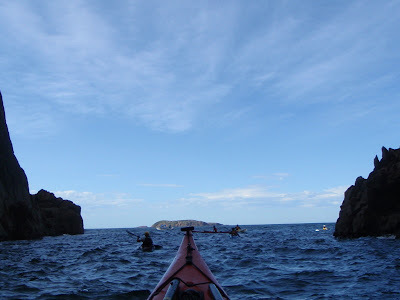 (below) A series of huge sea caves provided some shelter and a chance to practice turning and manouvering in a dramatic setting. Below: The sea skilled team - Terry, Karen (Sea Leader), Peter, Shane and Mick. Special thanks to Karen for excellent organisational skills on and off the water. You can see her below taking a rare break to explore a short cut while I keep an eye on things. Even Leaders need a break sometimes! NSWSKC at the Royal National Park.